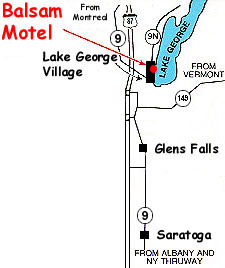 Our independently owned and operated motel is conveniently located in the Heart of Lake George Village. Just steps away from all the activities and attractions! From the South take the N.Y. Thruway to Exit 24 (I-87). Take I-87 (Northway) to Exit 22. Follow signs to Lake George Village. At end of ramp make right onto Rt. 9 South. We are 500 ft. past the intersection of Rt. 9 and Rt. 9N on the left. From the North Take I-87 South to Exit 22. Follow same as above.